Let me preface this by saying that I bought these pants because of Rachelle. 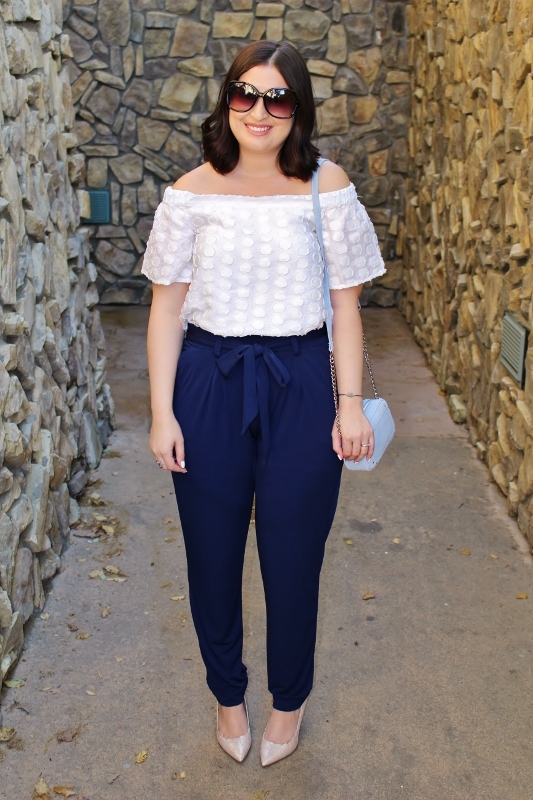 After seeing them on her, I immediately headed for Express and fell in love with the easy, breezy style of the tie waist trouser. They come in four different colors, but of course I had to go with my favorite shade (although the olive pair she has is very tempting. They didn't have any in stock so I went for the next best thing). This is quite the departure for me in terms of what I normally feel comfortable wearing, but I can't rave enough about them. Is it appropriate to go out in public wearing pajamas? Not unless you're heading to the ER, but these feel like pajamas, and who can complain about that? 1) At 5'2, these are definitely long on me, but they don't drag on the floor even when barefoot. However, they look best with heels. I may get them hemmed a bit...thoughts? 2) The material is a stretch jersey, so they are incredibly forgiving. I normally wear a size 8 in jeans, but was pleasantly surprised that I took a size small in these. Size down if you're interested. Also, I highly suggest wearing spanx or any type of under garment that is seamless for a smooth appearance from behind. No shame here, you guys know I love my spanx! 3) They don't have any zippers. Just pull them on and go! The tie can be pulled into a bow like I did here, but note how Rachelle wore hers. So happy you got them I actually wanted the pink one but it's gone in my size. Wore mine this weekend with a fitted tee and flat sandals. Love these pants and they look stunning on you as well. Ah! It is so fun to see you in such a different type of pants for you! I actually think these are very leg-lengthening and slimming, which I wouldn't have expected from this style. I don't know about hemming them- I think they look good now and I'd be afraid to mess them up! After seeing Rachelle and you in them, you have me convinced! I need to go try these on next time I am at the mall! They are adorable on you and I love the top you paired with them! One of my all time favorite looks on you! 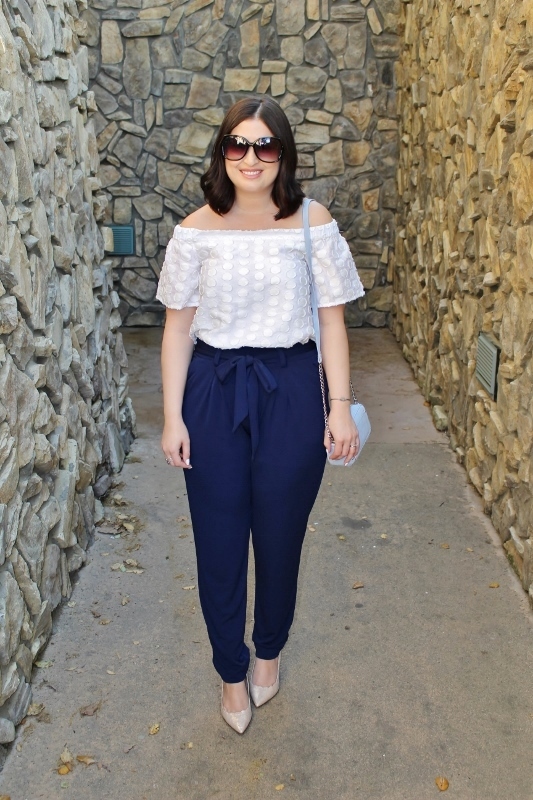 These pants look so great and I LOVE how you paired them with this pretty OTS white top! She is going to make us all want them! As soon as I saw this, I was going to say you and Rachelle are making such a good case for these pants. Then I read she enabled this purchase which made me LOL. I love it! They really do look amazing and effortless on you!